Pearl barley is something I always have in the cupboard but rarely use. It’ll be making regular appearances from now on because I loved the taste and texture in this salad. The recipe is based on one in the Moro cookbook but as I live so far from the shops I had to improvise based on what I had to hand. The original is made with sirloin steak and grapes. I used venison fillet and citrus fruit. My thanks to Sam and Sam Clark for the inspiration and my apologies for any mangling of their recipe. The quantity of pearl barley is quite small. As a main course it’s enough for two people but you may wish to add an extra salad. Simmer the pearl barley in a litre of water for 45 minutes or until tender. Drain and set aside to cool. Mix the marinade ingredients together and rub all over the steaks. 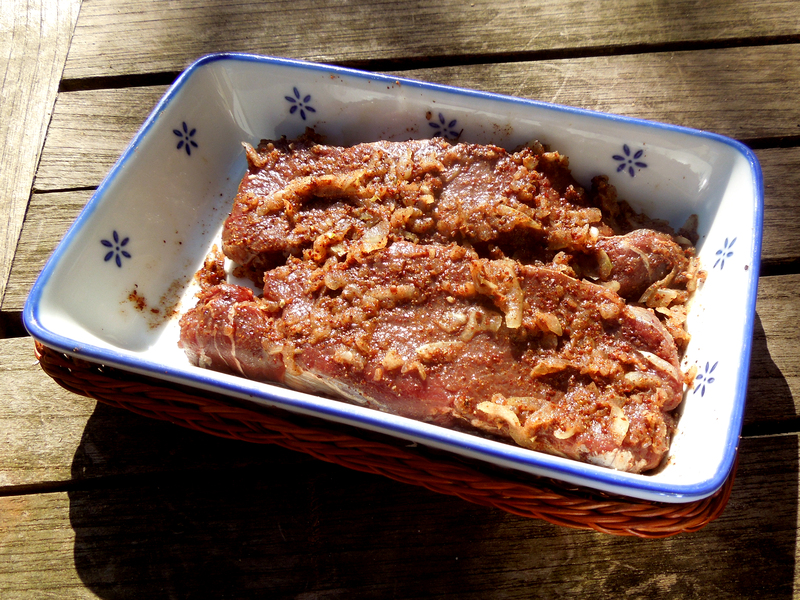 Leave to marinate for 2-4 hours. Blend the dressing ingredients together and season with salt and pepper. Heat a griddle pan until it’s smoking, rub the steaks with a little oil and sear the steaks for a minute or so each side, seasoning with salt as you turn them. Remove from the heat and rest the meat while you put the salad together. 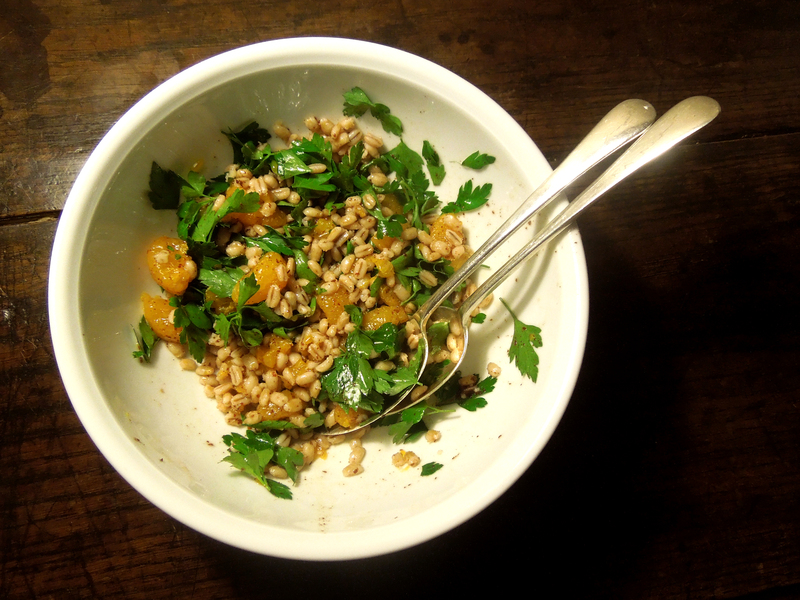 Put the barley in a bowl, add the whole parsley leaves and orange segments and pour over the dressing, mixing well. Cut the steak across the grain into slices about 1cm thick. Mix some of the strips into the salad and lay the rest on top. Serve immediately. 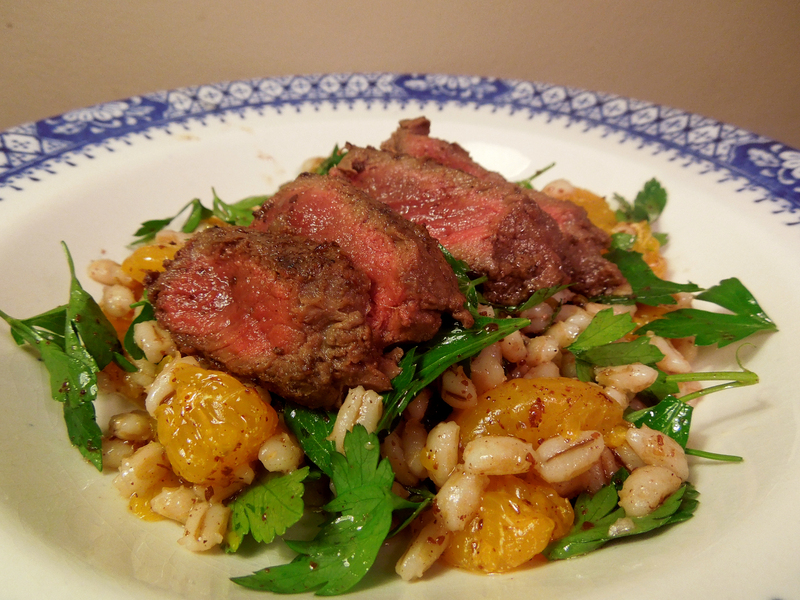 This entry was posted in Beef, Game, Mains and tagged pearl barley salad, seared steak with pearl barley and citrus, sirloin steak, venison fillet by Linda Duffin. Bookmark the permalink. That is such a great use of barley. It is usually only seen in hearty soups and that is a poor thing in my book. Love it! 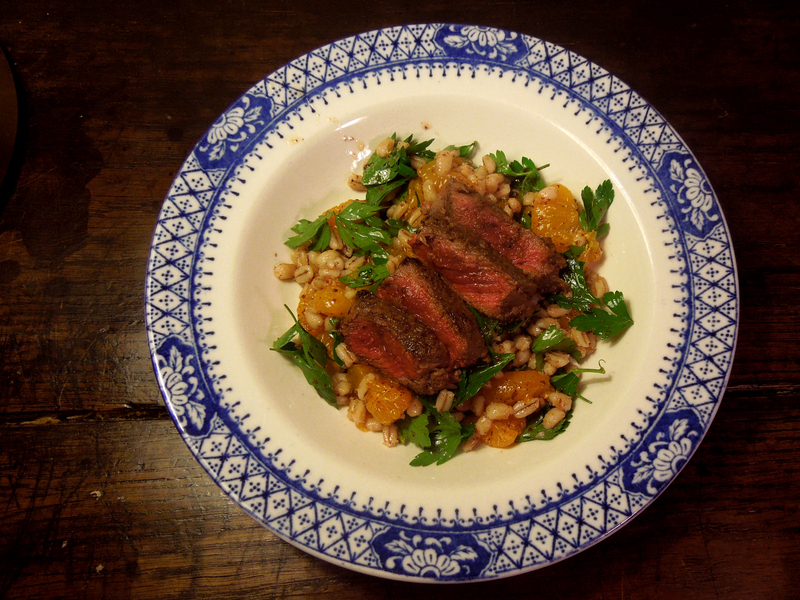 ‘Pearl barley – not just for Christmas.’ Or autumn/winter. Thanks, this is really quite summery. This looks delicious. My feelings about barley wax and wane, according to my most recent experience. 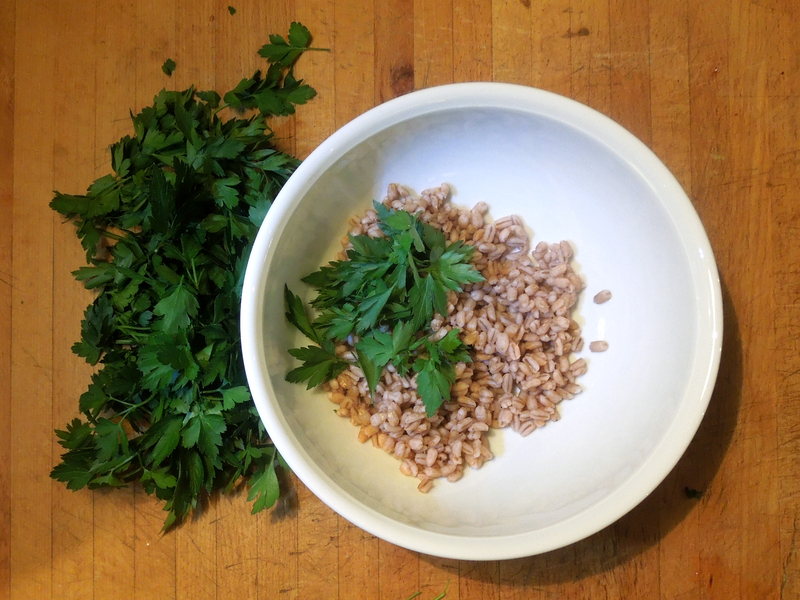 If not overcooked, I really enjoy it as you’ve done it here, but in soup and – God help us – “barlottos” it always seems too mushy too me, and leftovers that would be wonderful with farro don’t work at all for me with barley. On the other hand, I understand that European barley may be less pearled than what we get, which may be part of the problem. Anyway, lovely dish. I’d be happy to sitting down with it and glass of Côtes de Rhone tonight. Thanks. Thank you Ken. I haven’t had the US version so can’t make a comparison, but ours has a bite but is still yielding, if you know what I mean.